Dye sublimation is a printing technology that renders high resolution images on to the surfaces of duplicated or pre-recorded optical media like CDs, DVDs, and Blu-ray. It does this by using thermal and electrostatic application to stamp ink onto the disc’s surface. This method is also known as a type of thermal-retransfer. In order for discs to be used for this method, they must be manufactured with a thermal coating that can withstand the high temperature and pressure of the print head. Both at-home consumer and professional printing services employ dye sublimation in their printing processes. Dye sublimation uses 5 colors (cyan, magenta, yellow, black, and white) to reproduce images with sharp photographic quality at up to 600 by 600 DPI (dots per inch). The surface of these discs also resembles a photograph with a glossy finish. The process begins with a reverse image of the actual disc print being copied to a digital file and then printed on a layer of clear transfer film. This film is naturally charged with negative particles and is drawn through a tub of positively charged ink that recreates he file’s developed reverse image. The positive and negative particles bond on the film layer. This film is subsequently carried over the disc’s surface. The transfer applies the film layer with stringent accuracy using heat and pressure, which results in a vibrantly colored, high gloss image on the disc’s surface. The thermal bonding of the ink also introduces a scratch-proof, water-proof, fade-resistant surface. Professional disc printers with ink sublimation technology are manufactured by companies like Rimage and TEAC. 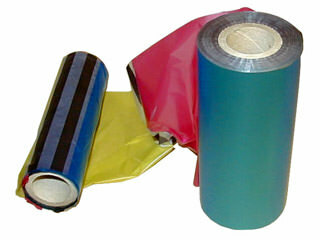 They employ special color ribbons in CMY, CMYK, or black in addition to a clear ribbon that acts as an intermediary to adhere to the color particles of the former ribbon to the disc. Due to the cost per unit use of multiple thermal transfer film layers or ribbons, this printing method is best suited for smaller volume short run disc orders or consumer printing projects. Many professional printing services who use this method also offer CD/DVD duplication services in addition to ink sublimation printing. However, some offer this printing method for quantities of up to 1200 discs or more.